We started this project to create products we were proud of, to build a brand in which the objective were not about chasing for trends, but rather to create a label that could be a vehicle for change, focused on people and sustainability, working with respect for traditions and the environment. Caboclo began back in 2005 in Barcelona –Spain, with the goal to produce beautiful and high-quality leather shoes, working hand in hand with craftsmen from a region called Cariri in northeast of Brazil, a place with a precious artisanal background, a heritage passed through generations. We consider the people and the process.Performing in a more responsible and sustainable level, Caboclo is about empowering, pride, dignity and hope, values that we believe feeds the cycle of construction and promotion of regional cultures. With the objective of rescuing regional culture, our mode of ethical production is through working closely with small, independent artisans to help grow their businesses and production capabilities, trying to maintain the production as manual as possible, valuing the hands, the time and care. Our productive capacity is not high, but we consider this as a value. We are also worried about making products with low environmental impact, using recycled tires, natural tanned leather and much love. We believe that the mixes between elements of specific cultures are relevant to generate originality and beauty. With a minimal and natural aesthetic, the brand creates transcendental objects that pay incredible attention to detail, resulting in unique and limited handcrafted high-quality leather shoes that never lose their value and which you’ll love to wear for years to come. Brazilian living in Barcelona since 2001, the brand founder and responsible for its development across the years, Juliano Lima is graduated in International Business (Barcelona University). He manages the production alongside with the artisans, all distribution channels, corporate and retail businesses and the relationship with distributors. Co-founder, Leonardo Lima worked for 20 years in the banking system as Managing Director. Traveling around the world, he realized that culture is what makes each of us unique, and through Caboclo he found a way to express his believes. Ana Comprés, alongside with Juliano, is the responsible of our shoes design, a work that combine a sensibility for urban style, simplicity and a hint of nostalgia. 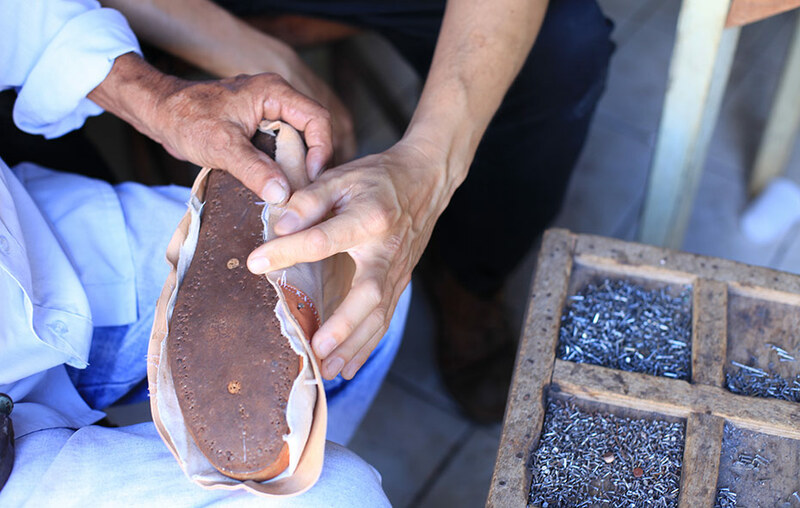 Ana and Juliano put care into creating durable and timeless leather shoes that tell a story of their own. She is also the responsible for the art direction of our stores, as well as for the coordination of our team in Spain. “We believe design goes far beyond aesthetics. We could not have got this far alone, and it would be impossible to mention all the people who made part of this dream, helping us to build this company and getting as far as we could until now. We are very thankful and you’re always remembered. You can find more information about our Barcelona team here, and know more about the artisans and our team in Brazil by clicking here. If you identified yourself with our products, brand or way of thinking, please get in contact. We are constantly looking for new partners, suppliers, wholesalers, retailers and media players to mutually cooperate in innovative ways.